BASED ON THE CONTRIBUTION OF YOUNG PEOPLE INVOLVED IN WATERLOO FC DURING THE PREVIOUS SIX YEARS, SIXTEEN YOUNG PEOPLE WERE CHOSEN TO TRAVEL TO HOLLAND AND GERMANY FOR AN EXCHANGE TRIP WITH VV UNION FC. The idea behind the trip is that you can engage young people through sport and offer opportunities for them to get to know and learn from others in neighbouring countries. The trip has helped young people to feel involved in the world around them, as well as appreciating the socio-economic differences between young people living in Europe and young people in the UK. Ultmately, Waterloo FC offers young people real opportunities to develop their key life skills and broaden their life experiences through sport. The BOOOST Project, funded by Southwark Council’s Joint Security Initiative Fund and was launched at Tabard Gardens in July 2009. The Launch highlighted the services Waterloo Sports and Football Club and partners were providing for young people in the Borough and Bankside Area during 2009 - 2010. The project also commemorated the life of David Idowu a local teenager who was stabbed and died in July 2008. David's mother Grace spoke about her determination to bring people together to eradicate knife, gun and gang crime. 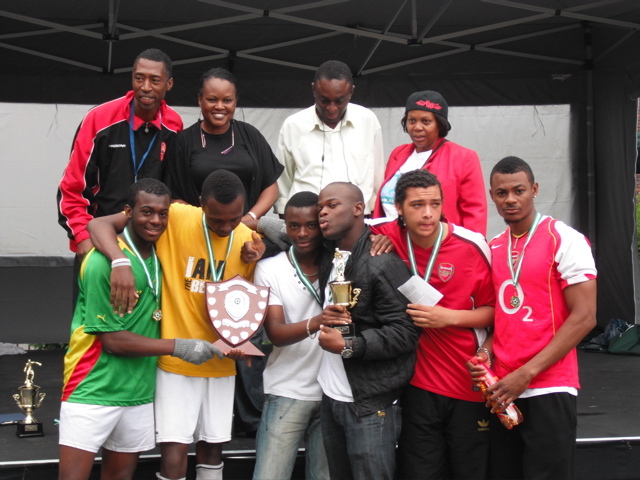 Waterloo FC organised the inaugural 'David Idowu Memorial Cup', the tournament attracted 50 young people and Grace Idowu presented trophies to the winners of the under 16’s and over 16’s Cup competitions. The project offered young people opportunities for healthy recreational activities, providing alternatives to crime or anti-social behaviour, drug misuse and to tackle the lack of opportunities that many young people face. Waterloo FC engaged 30 young people on the estate based structured coaching programme, with activities such as football, basketball, athletics, boxing and pathways into sports training and volunteering. A number of young people achieved the Sports Leaders Level Award and FA Level 1 Coaching qualifications and many are now volunteering or gained employment with the club. One of the benefits of the project, Manager Arnie Reynolds said, “is the increase in young people within the B&B area working together as a team and building friendships, sport has helped to break down barriers that often occur among young people from different estates/areas”.